"Cash was, is, and always will be - king. Always have cash in reserve. Cash is the ammunition in your gun. My biggest mistake was not in following this rule more often. Time is not money because there may be times when your money should be inactive... Often money that is just sitting can be later moved into the right situation and make a fortune. Patience-Patience-Patience. Patience was the key to success - Don't be in a hurry." - Jesse Livermore. How To Trade In Stocks, 1940. Two years ago, we began to note similarities to the beginnings of the Great Depression. Our thesis was built on financial history and circumstantial evidence. But now we can make a more substantial comparison with economic data. As you can see below, (from VOXEU.org) the world economy is either performing closely to or worse than the 1930s. For instance, the contraction in world industrial output is very similar. All assets go down in price when deflationary fear takes hold. This obviously occurred in 2008. But right now we are currently in the reflationary bounce which we forecast at the end of February. As we stated: "We expect an intense selling Panic in March, much like September’s action. The sell-off should end with the failure of a significant institution. This temporary bottom will support a sharp bounce into the fall." While we didn't have the institutional failure at the bottom (we aren't perfect), we did get the sharp bounce. It could continue into the fall. 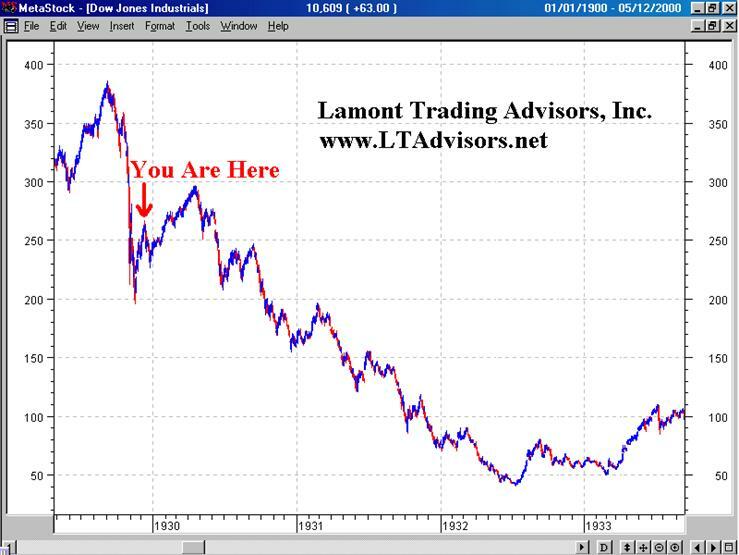 Using the 1929-1933 Dow Jones Industrial Average chart below, we have indicated our position in this bear market rally. It is hard to ignore the next major move on that chart-which is down in a big way. After this rally peaks, we expect a replay of the credit crisis. Except this time it will be permanent. 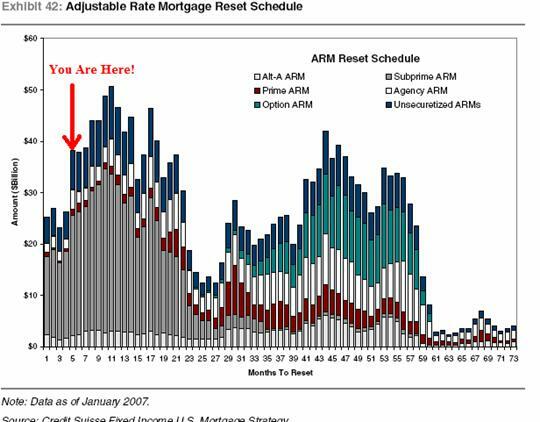 Option Arm mortgage recasts are arriving on schedule. We recommend Dr. Housing Bubble’s explanation of these truly insane loans. They are as hopeful as subprime mortgages. Our Credit Collapse chart, which assisted us in warning of the credit crisis, is updated below. 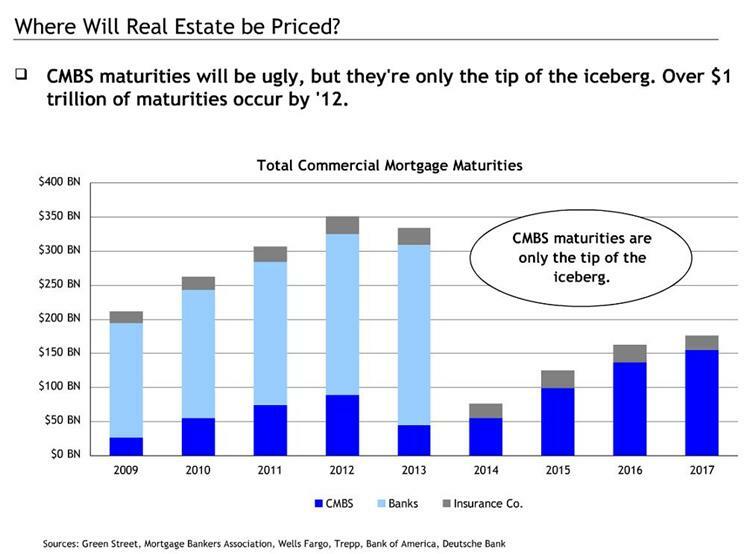 In addition to Option Arms, banks will also need to refinance over $1Trillion in commercial mortgages (see chart below). Banks don’t have the capital or the stomach for more losses. The bankers know they have bad loans coming down the pipe that is why they are hoarding reserves. Without more loans, defaults occur, prices fall and the downward spiral is reinforced. Over the next couple of weeks, we expect a return of fear. This correction will refuel the current bear market rally. We look forward to selling near the next bear market rally peak. Contact us if you would like us to update you during this critical juncture.